FAME-OUS COSTUMER: Scott Robinson is the costume designer for the upcoming U.S. premiere of the theatrical production �Fame Forever,� set to debut at the Waterville Opera House on Sept. 21. 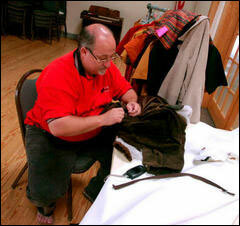 COSTUME WORK: �Fame Forever� costume designer Scott Robinson works on a jacket at The Center in Waterville on Friday. WATERVILLE -- Any good costume designer will scour a community, hitting fabric stores, thrift shops -- and even people's closets -- to produce just the right character attire. Scott Robinson, costume designer for the upcoming U.S. premiere of the theatrical production, "Fame Forever," has been doing just that, criss-crossing central Maine in search of materials and items to clothe actors in the upcoming opening at the Waterville Opera House. Robinson knows that outfitting is critical to making characters believable. "We help the audience understand them through how we costume them," says Robinson, of Ellensburg, Wash.
A professional costume designer and theater professor at Central Washington University, Robinson is in Waterville through Labor Day, helping "Fame Forever" Director Debra Susi prepare for the Sept. 21 opening at the Opera House. "I'm having a ball," the 49-year-old Alberta, Canada, native said Friday. "What better place than Maine to do it, and the Opera House has got a good reputation." Like any astute theater man, Robinson knows he's got a good gig here, working on a brand new show that ultimately puts Waterville in the national spotlight -- and which likely is headed for Broadway, according to those involved in the production. "Fame Forever" is the sequel to "Fame, the Musical," and had its international premiere May 3 in Glasgow, Scotland. The Opera House will be the first place in the U.S. to do the show, which was produced by David De Silva. De Silva conceived, developed and produced the 1980 Academy Award-nominated picture "Fame." He also worked on the theater version, which came later. De Silva chose the Opera House for the premiere of the sequel after visiting the city last summer and meeting with Diane Bryan, executive director of the Opera House. Susi directed "Fame" at the Opera House last year. De Silva said last May that he researched theaters that had done the show in the last year, heard Waterville had done it successfully and met with Susi. He said he plans to attend the U.S. premiere here, along with Ben Winter, who wrote the books and lyrics, and Steve Margoshes, who wrote the music for "Fame Forever." They will be looking at characters dressed in fabric from Jo-Ann Fabrics & Crafts and Marden's Surplus & Salvage stores, as well as clothes -- some to be modified -- from Good Will Industries thrift shops, Reny's Department Stores, and other places Robinson has explored over the last few days. "The whole process of designing for 'Fame Forever' is to figure out what these people are like in the script," Robinson said. He'll produce about 150 costumes, as some cast members wear more than one. He sketches the costumes, buys fabric and clothes, asks cast members what they have in their closets, confers with the director and set designer and gets a sewing crew together. His mantra is "What do we have, what do we have to borrow, what do we have to buy and what do we have to make?" The work can be tedious, but is essential to the success of the show. "I got a leather jacket from the thrift store," Robinson said. "It is brown and I don't want it brown, so I'm taking it apart and using it as a pattern to create a new jacket." The original "Fame" is about students who audition for the New York City High School for the Performing Arts. It follows their struggles, heartbreaks and triumphs after they are accepted. "Fame Forever" takes place some 20 years later and reveals the fate of some of the original characters -- now grown -- and their children, who are students at the school. Some scenes are set in 1980, some in 2004, and some in the future -- 2014 to be exact, according to Robinson. "We'll modify shirts and clothes to create the 2014 look -- it's going to have a bit of an Asian influence," he said. Robinson is used to coming to a new area and finding his way around. He arrived Sunday and already has been to a thrift store in Bangor, Marden's in Waterville, Reny's in Dexter and various other stores. "We got a bunch of stuff from Marden's -- it's perfect," he said. "I've done Reny's. I'm pretty good with a map. My first day here, I went to Skowhegan State Fair. It was great fun. I went to the cattle show and looked at trinkets." Robinson freelances all over the country doing theater work at places like Utah Musical Theater, Illinois Shakespeare Festival and Idaho Repertory Theater. Robinson is chairman of the Department of Theater Arts at Central Washington University; he also is director of the Summer Institute there. Susi, director of theater arts at both Maine Central Institute and Warsaw Middle School in Pittsfield, always is working on improving her skills. She has been involved in programs at Robinson's Summer Institute. Earlier this year, she staged "Joseph and the Amazing Technicolor Dreamcoat" as a final project for a master's degree from Central Washington University. Robinson was the committee chairman for her program and attended the show in Waterville -- his first visit to the state. He and his colleagues travel all over the world to review master's degree candidates' productions. When "Fame Forever" came along for Susi, she asked Robinson if he would do the costumes and he readily accepted, he said. He is paid to do the work. "Deb is absolutely wonderful," he said. "She's a great director -- she knows her stuff. This is really good for all of us. It's a good opportunity." Susi was at a director's workshop in Chicago this week, but he said they talk frequently on the phone about costumes.